Borgward nameplate is back on the market, and judging by the first steps, the famous German carmaker plans to rebuild its name in no time. After the big BX7, the manufacturer works on two more SUVs, which will hit the booming mid-size SUV segment. The new cars seem to be finished and ready for their big debut that will happen at the 2016 Geneva Motor Show. 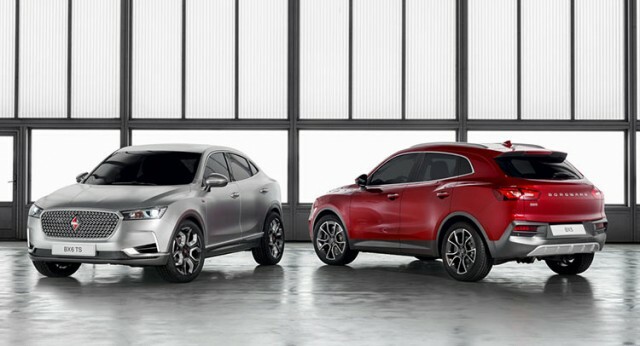 However, we can’t decide which one would be the bigger attraction – The 2017 Borgward BX5 or our favorite, the irresistible BX6 TS. The 2017 BX5 will slot between the large BX7 and the small BX3. The upcoming SUV will definitely try to compete against the German’s BMW X3 and Audi Q5 or Mazda’s CX-5, so it needs to offer some great things inside, out and under the hood. However, according to the spy shots we have seen before, the 2017 Borgward BX5 will feature a number of details from its larger brother. Still, this doesn’t refer to the large grille, which sports similar shape as the BX7, but in contrast to BX7’s grille that irresistibly resembles to the Buick’s new front styling, the mid-sized Borgward comes with a different slat configuration. O the other hand, the headlight and bumper styling looks almost the same, except it fits better to the smaller SUV. This is due the shorter, but more dynamic body, which is (by the way) amazingly good sculpted in the rear section. The interior design is still a big misery, but if the carmaker repeats the same treatment like it did with the BX7, then the 2017 Borgward BX5 could offer really great stuff in there. The premium trim would be equipped with a 12.3-inch infotainment system that gets Apple and Android connectivity and a WiFi hot-spot. 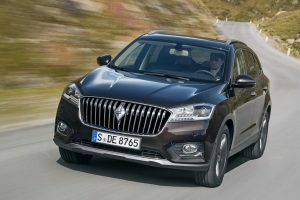 We are not sure what the new Borgward BX5 could offer under the hood, but the most likely option is the same 2.0-liter four-cylinder as it has the BX7. However, in contrast to 221 horsepower and 221 pound-feet of torque from the bigger SUV, the mid-sizer should be able to deliver around 200 horses. The unit will be matted to the both six-speed automatic and the seven-seed dual-clutch transmissions, as well as an optional all-wheel drive system. The interesting crossover is rumored to get a hybrid system as too. We have no the exact detail yet, but the first information indicates the output of 258 horses. Unlike the BX5 that will be a classic mid-size SUV, the 2017 Borgward BX6 TS promises a little bit more than that. This would be more interesting option due the coupe-like nature that combines sloping roofline and muscular side profile, which is brilliantly packed into the smooth and stylish body. 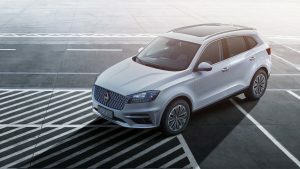 In addition, the new Borgward BX6 TS will have a plug-in hybrid system, which pairs the 2.0-liter engine from BX7 and an electric motor for the impressive power of 422 hp. There is nothing official regarding the pricing or released date, but we have found out that both models should arrive to Europe and China by the end of the year.